If all your food was coming from plant sources, as it is in a vegan diet, you would still be missing vitamin B12, which is only available in significant quantities in animal products. You could consume B12 supplements, but in a sustainable diet, you need to get all your nutrients from natural sources. Our bodies can store B12, so if you had plenty of it in your diet for years, you would have extra that would carry over for quite some time if you stopped ingesting it. Eventually, though, you would run out. According to Nourishing Traditions by Sally Fallon, the symptoms of vitamin B12 deficiency include “pernicious anemia, impaired eyesight, panic attacks, schizophrenia, hallucinations and nervous disorders, such as weakness, loss of balance and numbness in the hands and feet.” To quote from the Nutrition Almanac by John Kirschmann, “the brain and nervous system are first affected by vitamin B12 deficiency, which results in faulty formation of nerve cells.” This book also suggests that burning of the mouth could be a sign of deficiency and in the elderly, “symptoms of impaired mental function can mimic Alzheimer’s disease.” I’ve heard that irrational anger is an early symptom of B12 deficiency. In order for B12 to be used efficiently by your body, you need to eat foods that contain folic acid in balanced proportions and you need calcium, so make sure leafy greens, such as kale and collards are a part of your diet. I wondered just what it would take to get a day’s supply of B12, so I consulted the Estimated Average Requirements (EAR) which meet the requirements of 50% of the healthy individuals in the population and found that the EAR for B12 is 2 mcg. The Recommended Dietary Allowances (RDA), the amount sufficient to meet the need of 97-98% of the healthy population, is 2.4 mcg. These figures were updated in 1997 and are part of USDA’s Dietary Reference Intakes. I’ve used 2 mcg as the target amount for B12 in the following considerations. You would have to eat 2.6 large chicken eggs to get 2 mcg of B12. Surprisingly, if you were eating duck eggs, one duck egg supplies 190% of the B12 requirement. Duck eggs are larger than chicken eggs, but comparing the same weight of duck to chicken eggs, duck eggs contain 3.7 times the B12 as chicken eggs. These figures are assuming that you are eating eggs from chickens that get out to scratch in the grass. I have reason to believe that the eggs from confined hens would contain considerably less B12. I have heard of people avoiding eggs because of the cholesterol content. In 1971, before cholesterol was an issue, I learned in a nutrition class at Ohio State University that the egg yolk contains cholesterol, a nutrient that is necessary for our body to function properly, and the egg white contains lecithin, which helps the body use cholesterol the way it is meant to be used. Nature provides food for us in complete packages. When we separate those packages, thinking we know better, is when we get into trouble. 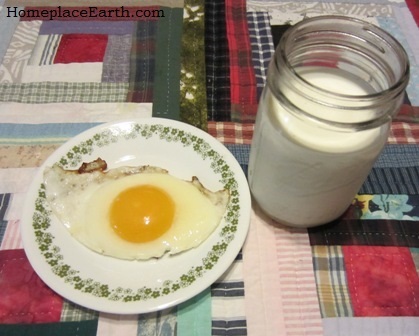 You could meet your B12 requirement with 1 large chicken egg and 1½ cups whole cows milk. Ideally the cow would get most, if not all, her food from pasture. I found that goats milk doesn’t have as much B12 as cows milk. It would take 2 eggs and 2.8 cups of goats milk to get a day’s requirement. A vegetarian diet generally includes eggs and milk. However, if eggs and milk are part of your diet, you also have to recognize that the young males and old females need to be part of your diet as well, if you are really going for sustainability. If not, what would become of them? You could keep feeding them and let them live out their days, but that would really increase your ecological footprint to bring you eggs and milk. We need to raise these animals with the least environmental impact and in a way that brings them into the circle of our food system. Rather than being the steward who manages things from outside that circle, we need to become part of the circle. We are nourished by the energy of the plants and animals in the circle. Reverence for all of it is part of this sustainable diet. It might be that pigs are part of your food system. They would love the whey and buttermilk from cheese and butter making. A 3 oz. serving of pork is 40% of your daily B12 requirement. You could raise rabbits, including alfalfa and other crops in your garden to feed them. A 3 oz. serving of rabbit meat contains three times the daily need for B12. Rabbit manure can feed redworms that become feed for your chickens. The resulting compost would feed the garden. The Integral Urban House suggests a system for raising rabbits and chickens in your backyard. Maybe you could work out a way to let your rabbits graze in your yard. When all your food comes from local and homegrown sources, you need to find a balance that nourishes both body and soul. When you eat a varied diet of whole foods, you can avoid deficiencies. Including animals in this way is much different than including animals raised in conventional systems. In a perfect world, considering sustainability, you wouldn’t need broiler or beef cattle production to meet your nutritional needs. You would be eating smaller amounts of meat cooked in different ways. 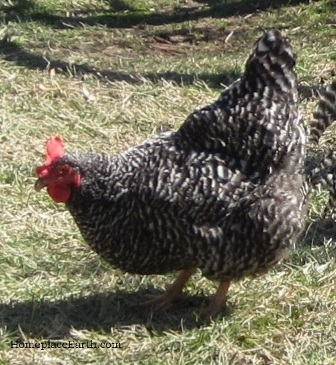 If you are buying eggs, ask the farmer what happens to the old hens and offer to buy some. Chopped chicken and gravy over mashed potatoes would be on the menu, rather than large pieces of fried chicken. The broth from stewing those old hens becomes chicken soup, known by both tradition and research to have health benefits. A sustainable diet sustains both you and the earth, with no deficiencies. Becoming a part of your food system is an adventure that I hope you enjoy.